OK--entirely off-topic for propertyprof. However, on-topic for my research. We were talking in my seminar the other day about the engagement of people in the nineteenth century with legal ideas--how newspapers published excerpts from judicial opinions, for instance. One of my students suggested that he thought the internet was, perhaps, bringing back some of that engagement (or at least the internet allows members of the public greater access to legal knowledge). Then he mentioned Hillary Clinton's senior thesis as an example of literature that people are now reading on the internet. I hadn't heard this, so naturally I was excited, in part because it opens up for discussion the question whether what people write (or hear) when they are in college can be used as a gauge of their later beliefs. This is a topic I have great interest in for the nineteenth century. A couple years ago I spent an some time mining college literary addresses at the University of Alabama as a gauge of ideas in circulation around this place in the antebellum era. It resulted in an essay, "The Law of the Descent of the Mind: Law, History, and Civilization in Antebellum Literary Addresses." Pretty fun project, though the confidence intervals for drawing inferences may be broad (and hence perhaps you can't tell a whole lot). I'm still working on a much larger project on literary addresses in antebellum northern colleges and a book on antebellum moral philosophy and jurisprudence, based in significant part on readings of college texts. Moreover, one of my favorite recent works of history, Peter Carmichael's The Last Generation draws heavily upon student writing to understand the hopes and ideas of antebellum Virginians on the eve of Civil War. Brilliant book--it's a great read. Here's a link to my review of it, "God and Man at the University of Virginia," which appeared recently in Reviews in American History. 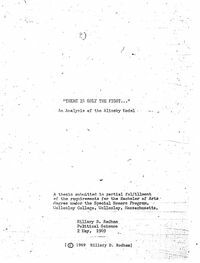 At any rate, through the magic of the internet we now have access to Senator Clinton's senior thesis, "There is only the Fight: An Analysis of the Alinsky Model." Draw your own inferences, though I suspect you'll find it tough to extrapolate much from this limited set of data.